The Land Rover Discovery SVX brings specially tuned Terrain Response System and Active Roll Control for the first time to the Discovery lineup. Land Rover has always specialised in creating massive, luxurious brutes that can literally clamber over anything that resembles a surface. Keeping in line with its extreme traditions, the latest luxury off-roading SUV from the Land Rover stable also happens to bring a lot of new technology to its Discovery lineup. 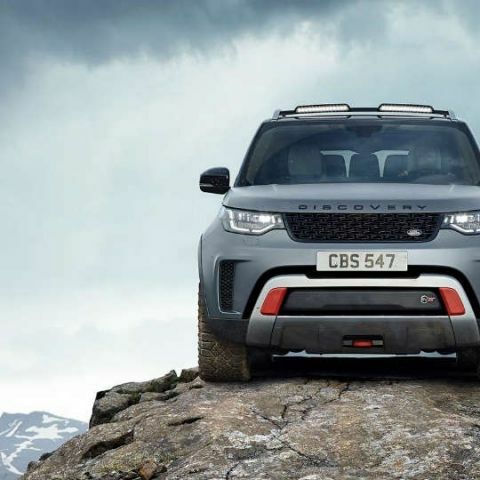 As a result, what you get with the Land Rover Discovery SVX is a familiar-looking SUV, which the company states is targeted at off-roading enthusiasts who do not mind taking it to office as well. The Land Rover Discovery SVX combines the luxury and practicality of the 2017 Land Rover Discovery, which was launched in India a short while back. Exhibited by Land Rover at the 2017 Los Angeles Auto Show, the new Discovery SVX comes with the 2nd generation Terrain Response system for advanced adjustments to suspension, stability, steering and overall dynamics, alongside adding more ground clearance and aluminium underbody protection to make it go anywhere. It also gets Active Roll Control, which increases wheel articulation and reduces body control to make it even more stable across uneven terrain. The higher ground clearance coupled with four-corner air suspension system further improves on approach, departure and breakover angles. The entire setup is based on 20" forged alloy wheels, and is powered by a 5.0-litre supercharged V8 engine which produces 525bhp and 625Nm torque. The Discovery SVX also does away with the traditional 'handshake' gear selector, and replaces it with a 'pistol' shifter knob. In terms of the technology inside, the Land Rover Discovery SVX gets the InControl Touch Pro infotainment system with a 10-inch display, integrated navigation, 360-degree cameras, Meridian-powered audio system and more, similar to what the 2017 Discovery or the Jaguar F-Pace offers. It also comes with an SVX Activity Key - a fully waterproof wristband that you can wear instead of carrying a key, and use it to lock, unlock or switch on the Discovery SVX. It is somewhat similar to the pre-production activity key that Land Rover's parent company, Tata Motors showed at the launch of its compact crossover, the Nexon. There is no word so far on when the Land Rover Discovery SVX will enter India, but expect to shell out a hefty premium over the seemingly timid 2017 Land Rover Discovery, if going off-roading in a canister of luxury happens to be your thing.